Explore the natural beauty and embrace the thrilling adventures of Chile on a 10 day highlights journey! 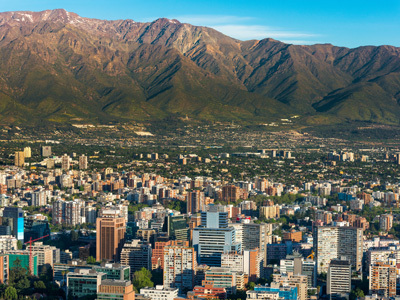 Your experience begins in the charming capital city of Santiago. Admire the architecture, learn about the rich history and embark on day trips to the coastal towns and tasteful wine valley regions. From there, continue on to Torres del Paine, nestled in the wonders of the Chilean Patagonia. The scenic landscapes, rich nature and incomparable attraction of this region offer the ideal platform for adventure discovery. Your exploration will then guide you to Pucon, to enjoy the wonders of one of our favorite lodges, Hacienda Vira Vira, for the perfect ending to your adventure! After breakfast, a private transfer will take you to Santiago airport where you will catch you domestic flight to Punta Arenas. Upon arrival to Punta Arenas, a shared transfer will drive you to your hotel, Patagonia Camp, just outside of the Torres del Paine National Park. Patagonia Camp is a camping ground like no other. Located on the shores of Lake Toro close to the Torres del Paine National Park, the camp is the ideal place to explore this part of Patagonia, combining the adventure of camping with the comfort of a hotel. Guests are housed in one of 18 yurts, all of which have a view of Lake Toro and the Paine Massif. There is one building that serves as a restaurant, bar and lounge and all are connected by elevated walkways. Excursions are organized by experienced and knowledgeable guides and focus mostly on hiking. This is a really unforgettable camping experience. 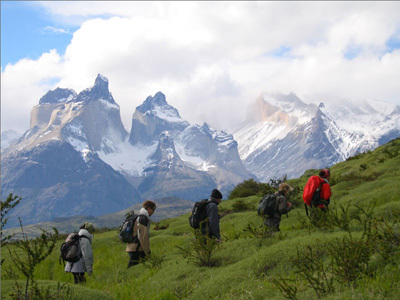 You will have three whole days to enjoy Torres del Paine National Park and Patagonia Camp excursions. Your fully inclusive stay at Patagonia Camp includes daily guided excursions with an English-speaking expert in small groups with other guests. With endless options to choose from, your days at the Camp will be filled with fun and adventure, no matter what your interests are. You may like to head out on one of the many treks or hikes of varying difficulty. Explore the landscapes and admire the scenery of the Base of the Towers, the Ferrier Viewpoint, Valle del Frances, or along the Fauna Trail, just to name a few! After breakfast a shared transfer provided by Patagonia Camp will pick you up to drive you to Punta Arenas airport to catch you domestic flight to Puerto Montt. Upon arrival, a shared transfer will be waiting for to to take you to your hotel, Hacienda Vira Vira, outside of Pucón. It is not just a Hotel – The Hacienda Hotel Vira Vira is set in a beautiful and unique location close to Pucón, Chile. Set along the shores of the Liucura River in a 23ha native park, it offers an oasis of peace and recreation. The native, mystical forest, the natural lagoon with Chilean beavers, the wide variety of birds as well as its beautiful location right along the shores of the Liucura river encourage you to explore a new adventure every day and to feel the mystic ambiance of these ancient Mapuche territories. “The Elegance of Adventure” – an experience all day long unrivaled by anything else. You will be enthused by the stunning views and majestic volcanoes. The guides are passionate about their work, about the excursions on offer and are truly excited to share their experience with you. Vira Vira also includes a complete farm managed by ecological standards as well as a modern cheese and milk dairy. The aim is to provide you with the most personal Hotel accommodation, with tailor made daily excursions and activities as well as with the best local food prepared with fresh ingredients produced daily by their farm. Enjoy the next three days exploring the region and partaking in Vira Vira activities and excursions. It is not just a Hotel – The Hacienda Hotel Vira Vira is set in a beautiful and unique location close to Pucón, Chile. Set along the shores of the Liucura River in a 23ha native park, it offers an oasis of peace and recreation. The native, mystical forest, the natural lagoon with Chilean beavers, the wide variety of birds as well as its beautiful location right along the shores of the Liucura river encourage you to explore a new adventure every day and to feel the mystic ambiance of these ancient Mapuche territories. “The Elegance of Adventure” – an experience all day long unrivaled by anything else. You will be enthused by the stunning views and majestic volcanoes. The guides are passionate about their work, about the excursions on offer and are truly excited to share their experience with you. Vira Vira also includes a complete farm managed by ecological standards as well as a modern cheese and milk dairy. The aim is to provide you with the most personal Hotel accommodation, with tailor made daily excursions and activities as well as with the best local food prepared with fresh ingredients produced daily by their farm. Sadly, your journey must come to an end today. However, you will be leaving with unforgettable memories and the experience of a lifetime! At an arranged time a shared transfer from Vira Vira will drive you to Temuco airport to catch your domestic flight back Santiago. Upon arrival at the airport of Santiago, you will connect with your international flight back home. Located in the heart of the artistic and urban Lastarria neighborhood, The Singular Santiago features a neoclassic architectural style, which was designed as a tribute to the cultural and historic surroundings. The property boasts an idyllic balance of impressive style, a picturesque setting and divine gastronomy, which all contributes to the memorable experience. Nestled in the cultural, natural and social hub of Santiago, The Singular Santiago invites you to savor the spirit of the city through relaxation, satisfaction and comfort. Between Chile's extreme landscapes of Atacama and Patagonia, lies the verdant Lakes District, a region awash with sparkling alpine lakes and wild rivers, snowy volcanoes, hidden hot springs and largely untouched National Parks that beg to be explored. Swiss-born Michael Paravicini fell under the area's spell during trips to Chile as a child and in 2014, he and his wife Claudia, fulfilled a lifelong dream with Hacienda Hotel Vira Vira, which they designed and constructed from the ground. Just 20 minutes from Pucón, this wondrous property sits along the shores of the Liucura River, surrounded by wilderness, and offers a true immersion in the region, coined 'The Elegance of Adventure.' Every single detail has been carefully curated, from the herd of Holstein cows that supply milk for the hotel's three-year-aged Parmesan, to the exhaustive list of expertly guided regional explorations, each aspect of the Vira Vira experience is intentional and extraordinary. This is just one of many authentic travel experiences offered by Global Basecamps. If you are interested in more unique destinations to Chile with unprecedented planning and extraordinary service visit our main tours in Chile South America page to browse other sample trips.